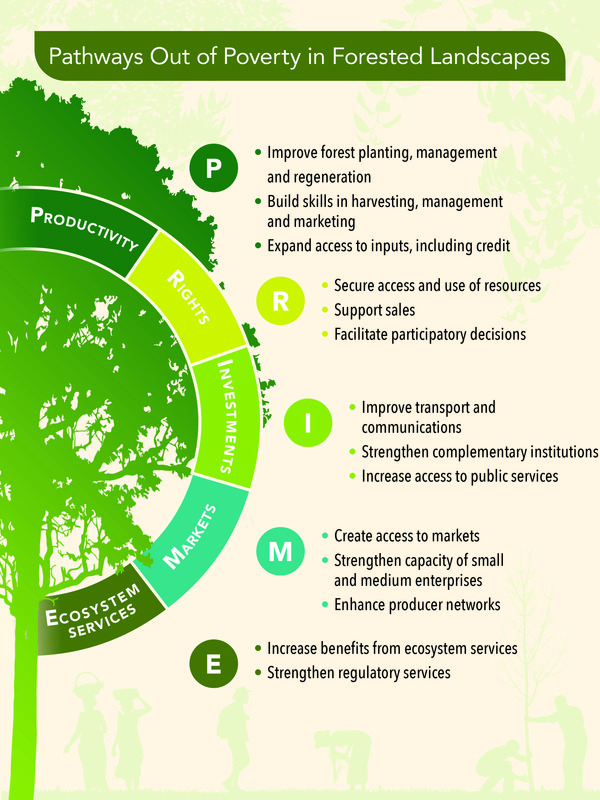 Five broad pathways can help launch the forest-dependent poor onto a sustainable path toward prosperity. These pathways, referred to as PRIME, identify economic development strategies and build on the premise that forests themselves will remain intact. PRODUCTIVITY: Growth in labor and resource productivity (P) is integral to economic development. In forested landscapes, labor productivity can be improved by enhancing individual and community skills in sustainable forest management. Resource productivity can be improved through the infusion of capital (for instance, portable sawmills), forest fire and pest management or tree plantations. Associated technologies, policies, and capacity strengthening activities need to meet the requirements of women, indigenous people and other marginalized households to ensure that the poorest benefit. RIGHTS: Wealth accumulation is an essential pathway out of poverty. One strategy is to increase the wealth of the poor by strengthening their rights (R) over natural capital. A large literature and local environmental movements point to the importance of community rights to use and sell forest resources in poverty reduction. Within forested communities, empowering women and other marginalized individuals to have tenure rights and decision-making power is particularly important. INVESTMENTS: Poverty reduction in forested landscapes will not be possible without investments (I) in complementary institutions and public services. Forest-related pathways to prosperity are only likely if the poor also have inclusive and affordable access to complementary public services such as education, health, agricultural extension, transportation and mobile phone access. The role of gender-responsive institutional arrangements in providing information, enabling local level innovation and offering insurance from down-side risks will be important. MARKETS: Income generation and diversification require strengthening small and medium timber and non-timber enterprises and increasing their access to markets (M). Markets for a small number of high-value non-timber forest products (e.g. Brazil or Shea nuts) offer one pathway that is likely to be more beneficial to women, for example. Timber certification and export markets for timber offer an alternate broader approach. This pathway may need careful designing to be responsive to the preferences of women, indigenous households and youths, and, conservation requirements. ECOSYSTEMS: Ecosystems and their hidden services (E) are integral to prosperity. Over the last decades, policy instruments such as eco-tourism, payments for ecosystem services and carbon markets have proven to be useful mechanisms to regulate ecosystem services and their benefits. It is important to channel this demand for ecosystem services into monetary and non-monetary support for the poor, and, women within poor households.